More than 4000 words defined. Based on a study of words children need to know for reading achievement. "We all want our children to be excited by learning and gaining an early command of our language. 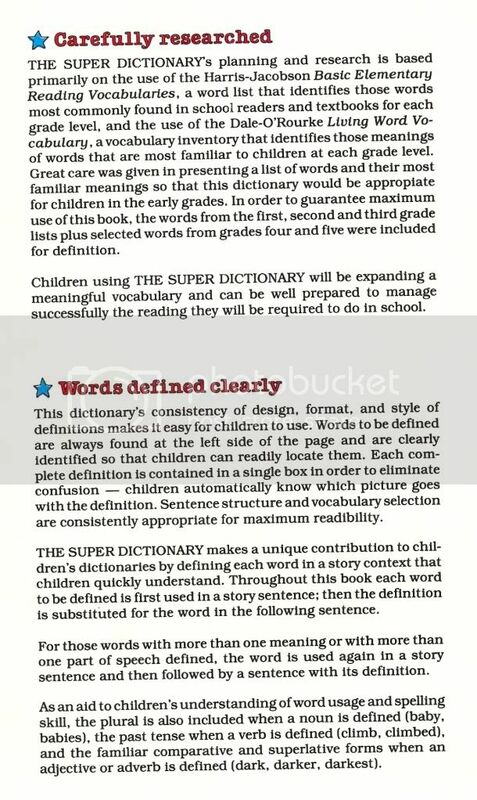 This superb dictionary was carefully and systematically researched to accomplish just these things. Based on established educational methods, it contains all the words children need to know in the early grades. And it is so dynamic in design that children are highly motivated to use it. 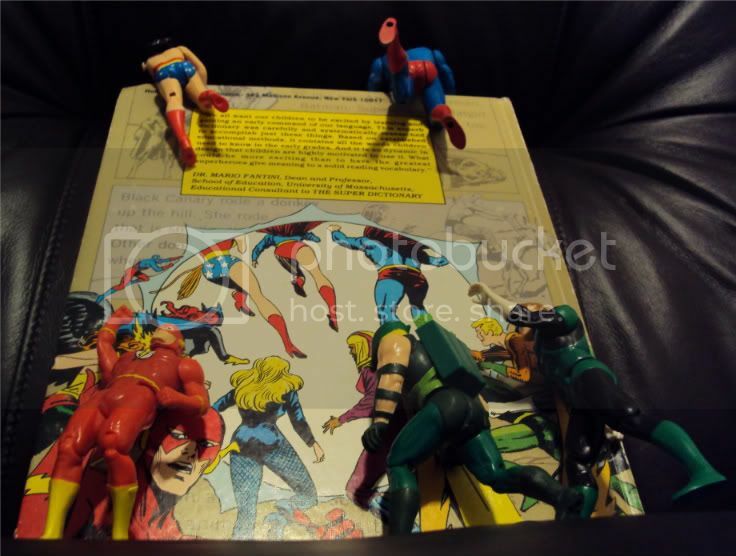 What could be more exciting than to have the greatest superheroes give meaning to a solid reading vocabulary." Inside, the book elaborates on its educational content. It does seem very sincere in its desire to educate children and expand their vocabularies. 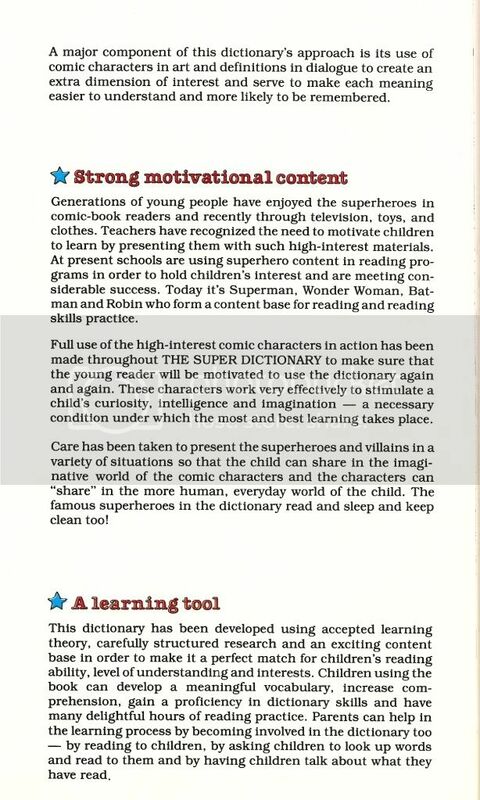 There are several more pages after this, with the Atom explaining how to read and use the dictionary (this, I believe, is intended for the child reader). Then there is a list of all the characters in the book, each with their names, a description of the who they are and what they do, and a small picture of them. 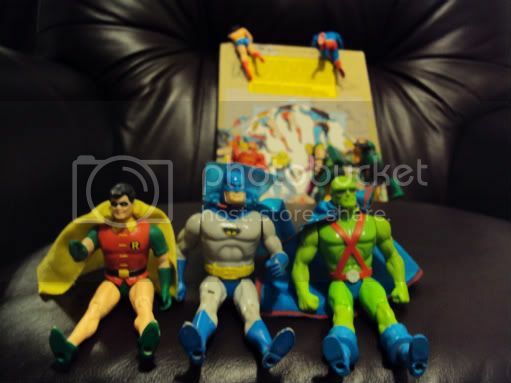 Aquaman, Atom, Batgirl, Batman, Black Canary, Catwoman, Comet, Conjura, Jonna Crisp, El Dragón, Firehair, Flash, Wilson Forbes, Green Arrow, Green Lantern, Hawkgirl, Hawkman, Jody, Joker, Krypto, Lois Lane, Lex Luthor, Jimmy Olsen, Penguin, Robin, SR-12, Supergirl, Superman, Tomahawk, Ted Trapper, Teri Trapper, Wonder Woman. The Super Dictionary features some original characters, one of our favourites here being El Dragón. Other characters included Conjura, Jonna Crisp, Jody, SR-12, Wilson Forbes, Ted Trapper and Teri Trapper. You can read more about them here. According to Brian Cronin's Comics Should Be Good and the Obscure DC Characters website, Conjura was originally Zatanna, but was changed to be African-American. Mojojojo from the cartoon show Powerpuff Girls, a villain with a habit of over-explaining everything in a redundant manner, was inspired by the Super Dictionary. 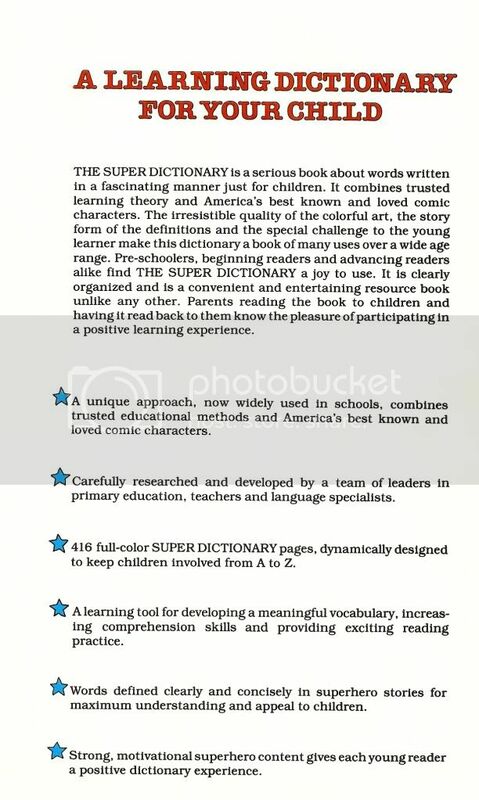 Creator Craig McCracken has said that he would "sit around reading that book and just laugh over [the Super Dictionary]." There is a LiveJournal community dedicated to fanfic and fanart (among other forms of creativity) inspired by the Supderdictionary, appropriately called fortycakes. We like to make jokes about what was going on in the minds of the people who created the book, as many of its entries can be interpreted as confusing and bizarre, sometimes even disturbing and perverted. That's kind of why we love it. 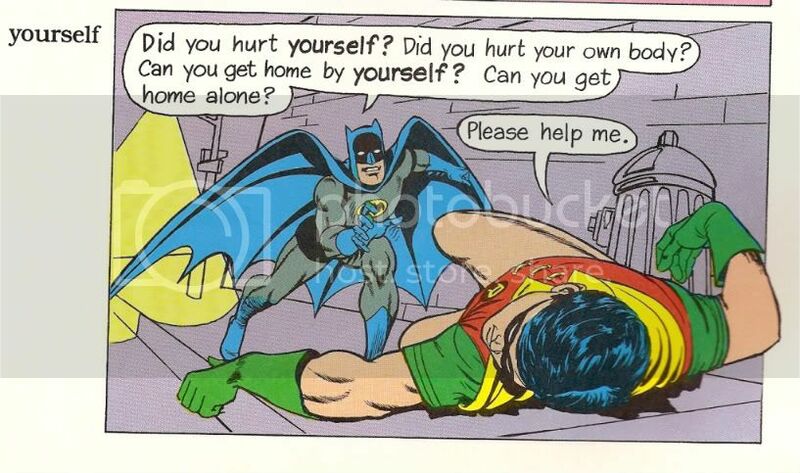 (Poor, poor Robin.) 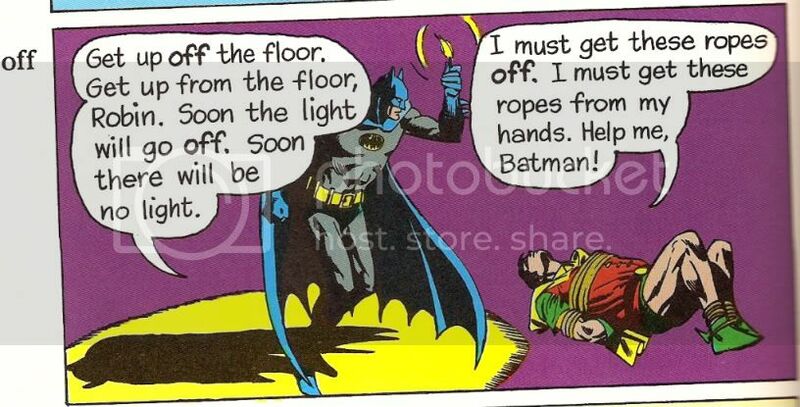 Thanks to icon_uk's post here, we can see how that last entry (and I think the "promise" one too) is an example of art borrowed from other comics. 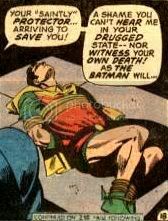 In this case, it was from the story in Batman #246 called "How Many Ways Can a Robin Die? ", which was pencilled by Irv Novick. 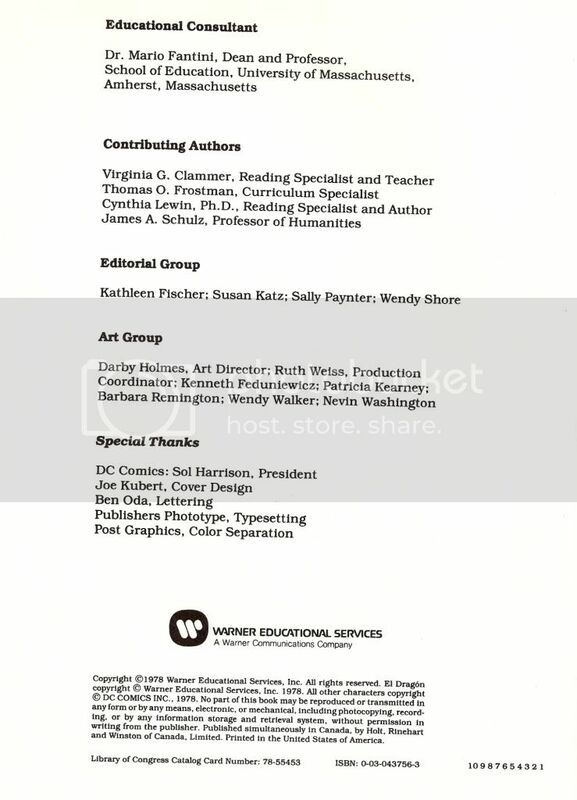 Let's take a closer look at who is credited as being involved in the creation of the volume in question. There's someone who did the lettering, and as I mentioned above, Joe Kubert did the cover, and the authors all seem to be educational experts. There is a group of people credited as working on the art, but the book doesn't seem to credit the creators of any of the original artwork, from which it borrowed so heavily. 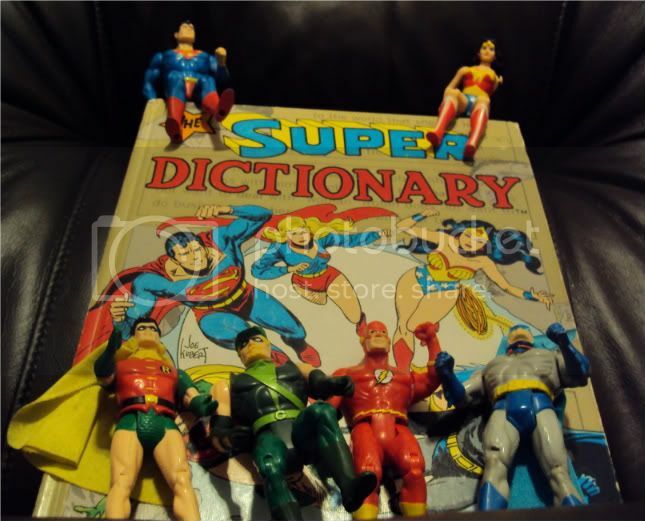 Now, I know people often say that they wish DC Comics would re-print the Super Dictionary, giving us nice, new and shiny copies of the book, instead of us having to hunt them down on e-Bay. The bulk of the original artwork in the book was seemingly used without full credit given (at least as far as it is given on the page scanned above). I would imagine that today, any republication of old works published by DC (or any other Warner Bros-related entities) would not be worth the risk of getting sued for not giving proper credit and paying the appropriate royalties to any creators whose work was used in a book. 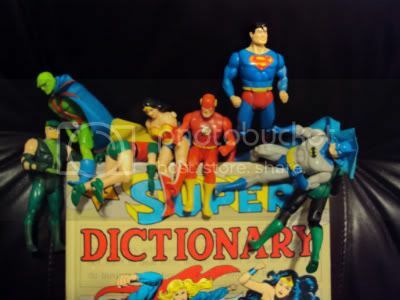 I know at some point, someone here at s_d had the brilliant idea that DC should create a new Superdictionary, ideally with the creative team of Franco and Art Baltazar, of Tiny Titans fame, writing and illustrating. If such a book were created and published, that would be pretty darn awesome. 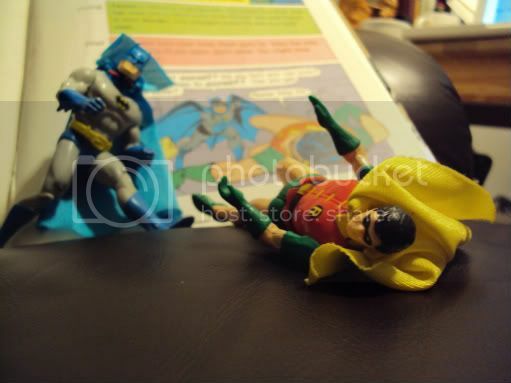 It's no stretch to imagine such a thing being enjoyed by kids and Superdictionary fans alike.